While the series Downton Abbey unfolds before throngs of obsessed viewers, the curious relationship between the upper classes and their servants during Edwardian times is portrayed in all its bewildering manifestations. In the new book The Real Life Downton Abbey by Jacky Hyams, the society where such interactions occurred is explained and explored to help us better understand a uniquely British phenomenon. The book is divided into sections which help to clarify all aspects of servant/employer relations, including chapters on how households were set up, money (both how much wealthy aristocrats were getting through and how little the staff was expected to survive on), manners, food and relationships. One very useful section details the "pecking order" of the staff. Starting from the top (the butler) all the way down through the ranks to the lowliest of the lowly (the downtrodden scullery maid), the author details everyone's position in the hierarchy and just what exactly each job entailed. I was very interested to read, for instance, the different duties of the butler vs. the valet vs. the footman, and what the various maids might be expected to do as part of their daily chores. I was also fascinated to read more about how many American heiresses (including Winston Churchill's mother) came over to England at this time to marry into aristocratic, if not exactly super-rich families, injecting a welcome dose of cash -- along with a somewhat unwelcome disregard for obeying the rigid conventions of British society. The social time period that is being observed is mainly the Edwardian period, covering the years from Queen Victoria's death in 1901 and the ascension of her son King Edward VII to the start of WWI in 1914. After the war, many things conspired to make the old servant/master class more or less obsolete: heavy death duties which reduced enormous fortunes to shadows of their former grandeur, more employment opportunities in factories and towns for unskilled labor, and a growing sense of independence among the lower classes that came from having an income and life apart from that of the folks up at "the big house." While many people today would feel that the life of the domestic servant of 100 years ago was nothing to aspire to (little privacy or free time, poorly paid and involving backbreakingly hard work), the truth is that many people "in service" felt fortunate to have such a position. They were living in a clean, safe environment and knew where their next meal was coming from -- luxuries many from the lower classes didn't have at that time. During and just after Victorian times, many people in society viewed poverty as a part of life that was unavoidable. After the social upheavals following WWI, many came to demand that the government step in and help the poorest in society to obtain a better standard of living. As the author provides details of particular situations within the house, she gives examples of the corresponding character in Downtown Abbey for reference. 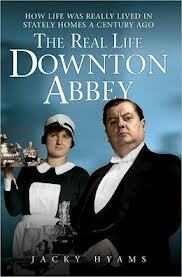 For instance, "lady's maid O'Brien" or "the butler Mr. Carson," which helps to give a frame of reference. The book is also illustrated with lots of black and white illustrations of stately homes, servants, and ads from the time period. Each chapter also ends with some more detailed facts and statistics from that era that help to put the information into context. Disclaimer: I received a copy of The Real Life Downton Abbey from Independent Publishers Group in exchange for this review.